1. 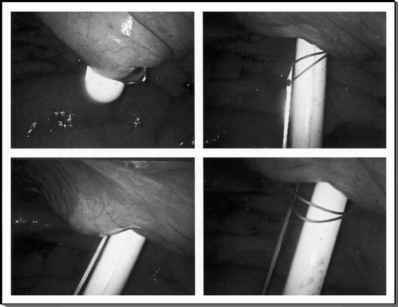 10 mm trocar is placed in the umbilicus for the introduction of the camera. The surgeon will work on the left of the patient with two 5 mm trocars that are placed above and medial to the iliac spine and another between the lateral and umbilical port. The trocars for the assistant will include a 5 mm trocar that is placed above and medial to the right iliac spine at MacBurney's point and a second 10 mm trocar on the pararectal line between the umbilical and lateral port on the right (Fig. 1). FIGURE 2 ■ The triangular trocar variation involves placement of the surgeon ports on the left side between the umbilical port and the left iliac spine and the other two-thirds of the distance between the umbilical port and the suprapubic rim along the midline. 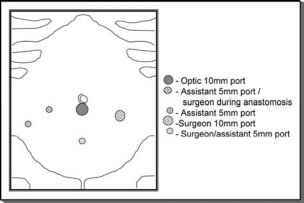 FIGURE 1 ■ The first trocar position variation involves placement of all the ports as high as possible with respect to the umbilicus, the left side ports are used by the surgeon and the right side by the assistant. 2. An optional trocar placement involves changing the surgeons trocars using a triangulation position. They are introduced, midway between the umbilical port and left iliac spine and the other two-thirds of the distance between the umbilical port and the suprapubic rim along the midline (Fig. 2).